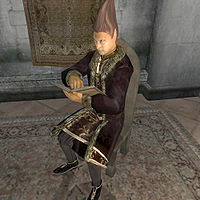 Umbacano was an Altmer mage and suspected Ayleid Revivalist. In 3E 427, he was working at the Yassu glass mine in the dangerous Red Mountain region of Vvardenfell, along with a fellow Altmer Ayleid enthusiast named Sorcalin. By 3E 433, Umbacano had migrated to the Imperial City, become considerably wealthy, and had begun employing adventurers to seek out Ayleid artifacts across Cyrodiil for his private collection. In 3E 433, Umbacano enlisted the Champion of Cyrodiil to search the province's Ayleid ruins for ten ancient statues known as the Ten Ancestors. He also tasked the Champion with recovering an ancient carving from the ruins of Malada, as well as the crown of Laloriaran Dynar, the king of Nenalata. It is not known if the Champion recovered the crown or accepted rival collector Herminia Cinna's proposal to trick Umbacano into accepting the crown of the rival city of Lindai. What is known is that Umbacano took one of the crowns to the throne room of Nenalata and attempted to use it in order to restore Nenalata to its former glory. There are conflicting accounts of what happened next; some say that Umbacano used the crown of Nenalata, resulting in his soul being replaced by that of an ancient Ayleid king, taking on a vampire-like appearance and resulting in his death and the hands of the Champion of Cyrodiil. Others say that he invoked the crown of Lindai and inadvertently killed himself, destroying the crown in the process. It is known, however, that Umbacano died inside Nenalata. This page was last modified on 3 March 2018, at 21:57.